Anywho back to the point- more storage needed. I registered for these awesome fluffy towels, I love them, they make me feel like I'm at the spa. But who knew they would take up twice as much space in my closet?!? Actually I should say, who knew my old ones were so crappy. That Martha, of course all these photos are from her. She has the best ideas. I like storing extra supplies over the door too. All my Extreme Couponing hording products could have a new home. 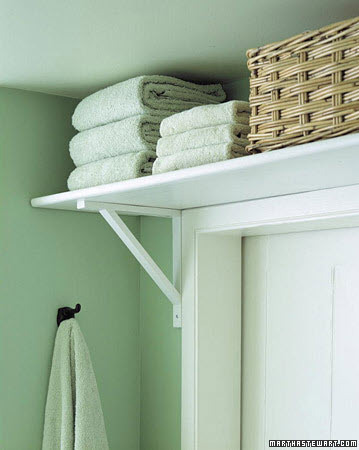 I also like this towel bar idea. Unfortunately I don't think the husband would hang the towels properly (by properly I mean folded in 3rds the long way and then folded in half to hang, you know what I'm talking about right?) and the messy look might would drive me nuts. I think I might have to stick with the hooks that we have. Bummer. They're such a great idea -- I had the same inspiration after seeing those Martha photos! I love mine. What a great idea! We don't have a linen closet in our place, which is so aggravating. This is a great solution, although I'd need a step ladder to reach them! 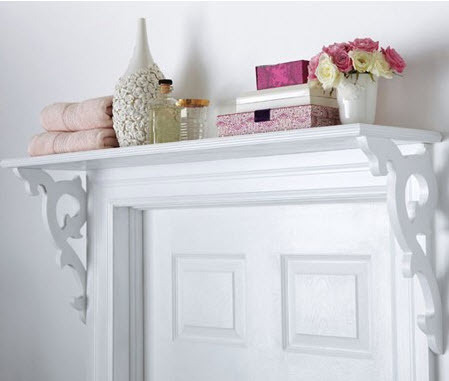 I love the over the door shelf. I would just go to Ikea to get the supplies. They have a great selection of hanging shelf type things. I am sure you are a very nice person. But if you mention your husband, hubby, hubbo, etc., one more time someone should stick a fork in your eye. We get it! You're married! You won a man! You're a winner! You've arrived. Please. I'm enjoying the blog except for you referencing that ALL THE TIME. Now I am trying to find a spot. 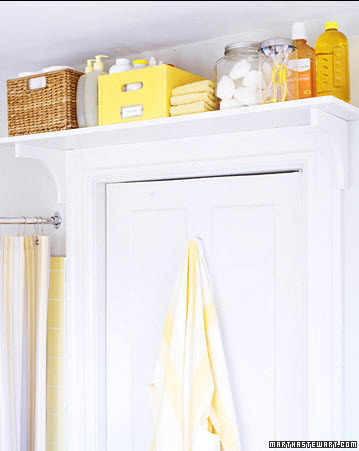 I love the over the door shelving idea!! That is very cool! Oh, and I have a new Designer Pillows Giveaway I hope you will join! What a great idea. I'm lucky to have plenty of storage but think that a shelf above the door would make a good opportunity to accessorize-maybe with seasonal items. Just like me after our wedding. The interior of our house has changed to accomodate our gifts and my wife's old belonging since she only moved into my house right after we married. It's challenging and fun at the same time. Love the shelf idea!! Thanks for sharing it. And good luck with finding space to put everything. 7+ years later and I still have wedding gifts that don't have a permanent home. I'm installing one THIS weekend!! I love the little nook above the door. Perfect for some extra storage. 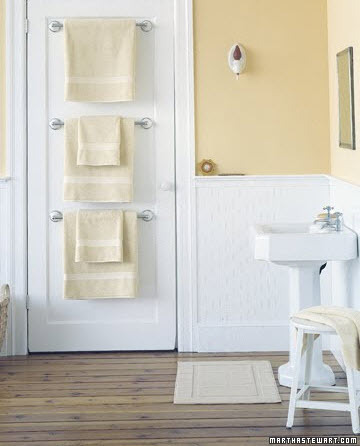 These are fabulous ideas - and I so agree on the stacked towel racks. The effect is totally ruined when you don't fold properly! Leave it to Martha. I love it all. And yes, the right way to fold a towel is in thirds then in half over the bar. My hubs doesn't do it either. Fabulous idea! I'm going to tab this for the future!